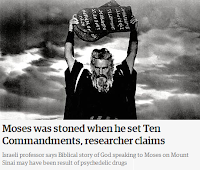 Wisdom Quarterly: American Buddhist Journal: Moses saw God "because he was stoned - again"
I'll just walk it off. I don't need any help, Aaron and Hur. I'm fine. I saw God, gosh darnit! Prof. Shanon's claims are made in this book. The [Judeo-Christian] Bible tells us that when the Children of Israel left Egypt, they had a 40-year trip through the desert before reaching the Promised Land. Now a leading Israeli academic has a new theory about exactly what kind of trip it was. 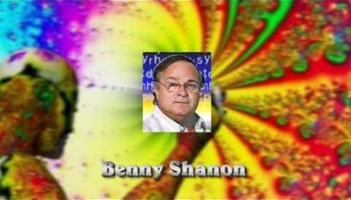 In the philosophy journal Time and Mind, Prof. Benny Shanon states that key events of the Old Testament are actually records of visions by ancient Israelites high on hallucinogens. Benny Shanon is a professor of psychology at Jerusalem's Hebrew University, where he used to head the psychology department. The psychedelic [concoction from the Amazon] is a drink called Ayahuasca. It is [formulated by combining two] plants that grow in [the Amazon, but two other plants that grow in] the Holy Land and in the Sinai peninsula [also make the same hallucinogenic or, more properly, entheogenic compound, which] is still used today by Amazonians in Brazil for their religious rituals. Prof. Shanon came up with his theory when reading the [Jewish] Bible. The events described reminded him of the visions he had after trying this [vision inducing] drink 15 years ago. So when Moses first encountered God, he was high [on a powerful, sacramental substance used for ritual purposes]. "Encountering the divine is one of the most powerful experiences associated with high-level Ayahuasca inebriation," claims Prof. Shanon. At the Burning Bush, covered in flames but mysteriously not consumed, there was no miracle, just a drug-induced "radical alteration in the state of consciousness of the beholder -- that is, Moses." 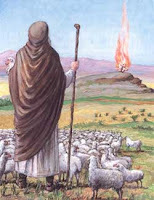 The account of the Children of Israel hearing "God" while camped at Mount Sinai is about a mass [spiritual ritual] drug-taking event -- giving a whole new explanation for the reported "cloud of smoke" that settled on the mountain. And when Moses climbed Sinai and received the Ten Commandments and the Bible, he was tripping. Hardly an incident in the Bible is spared Prof. Shanon's drug-focused reading. 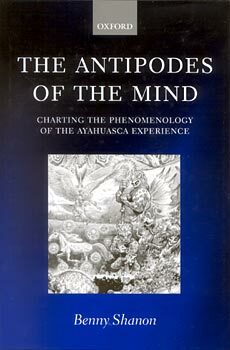 Acacia trees, used by Noah to build the ark, were revered because some varieties contain the psychedelic substance dimethyltryptamine (DMT) [a powerful entheogen found throughout nature but not usually available to the body]. Rabbis in Israel and the UK are largely ignoring Prof. Shanon's theories, and those who have spoken out have been dismissive. "The Bible is trying to convey a very profound event. We have to fear not for the fate of the biblical Moses, but for the fate of science," Rabbi Yuval Sherlow told Israel Radio.